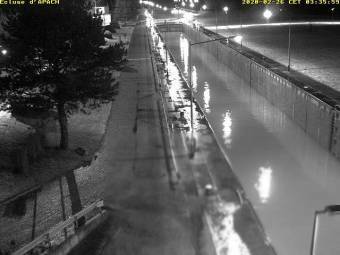 It's 11:06 in Apach, France right now. Mettlach: Saar Loop at Mettlach, 9.8 miles away. Luxembourg: Luxembourg Airport, 14.6 miles away. Mertert: Landscape View, 16.8 miles away. Trier: LDO-Cam, 23.3 miles away. Medernach: Camping auf Kengert, 24.5 miles away. Püttlingen: Köllerbach-Herchenbach, 26.6 miles away. Tholey: Schaumberg Weathercam, 29.9 miles away. Rezonville: Météo-Rezonville, 30.9 miles away.